A Rowman rep from Lyons Press reached out to me in late 2016. At the time, I was working with Cox Media Group (Atlanta Journal-Constitution, SEC Country, etc.) and my stories about SEC football had caught the publisher’s attention. I agreed to a contract not long after and did the bulk of the writing between May and October of 2017. Former Columbia Missourian sports editor Greg Bowers demanded something “interesting” (i.e. abnormal) from every story, whether he got it or not. During the first week of the football season in 2013 – a season in which the Tigers wound up one quarter away from the national title game – I decided to test his limits and wrote about a stadium water shortage instead of the football game. I met my deadline, and Greg didn’t chew me out. Moments like that gave me confidence that I could take a creative artistic direction with my professional work and produce strong results. Don’t stress too much about the specific major you select within journalism. I chose a somewhat narrow path – Magazine Writing – and still developed a wide range of skills my junior and senior years. You can pursue any opportunity you want, if you make the time for it. Walking into my dorm freshman year (Hatch Hall, which featured journalism-specific housing) and being surrounded by creative people with interests similar to mine. I had no idea at the time – because it took me months to break out of my shell – but some of my best friends were in that building, including a handful who attended my wedding five years later. The summer between my sophomore and junior years, Mizzou sports officially switched conferences from the Big 12 to the SEC. Little did I know that swap would give me the Southeastern football experience I needed to eventually land a job at the Atlanta Journal-Constitution, which in turn led to me writing a book (!) about SEC football. 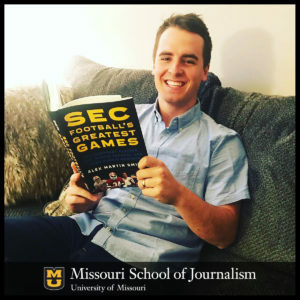 Only three years passed from the time Mizzou made that switch to the time I got the book offer. I’d call that a life-altering move.